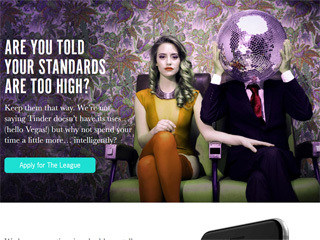 TheLeague is a dating app for anyone looking for higher standards. If you are extra picky and just find the types you're meeting on PoF or Tinder aren't cutting it, then read on. They set themselves apart as a place for dating intelligence. What the introduction tells you is that they look for people who match you on an educational level and a professional level. There are scores of other dating apps and websites out there that do the same. But is TheLeague doing anything drastically different? Before you start with the app, you'll need to be clear just how much information they need. This isn't a regular dating app where you fill in a quick form and then you are good to go. It wants to delve into your social media profiles. This it's stated is to find you better matches on several levels. If you aren't comfortable with this, or don't use social media, then this app probably isn't for you. To get started you will need to link your Facebook profile to the app. It will access your Facebook friends, and your photos. From that it will create a basic profile for you. They will keep a note of your circle of Friends on Facebook and they commit to never matching you with anyone you've friended on Facebook. You'll also need to add a LinkedIn profile. Together these are used to build up a complete picture of your personal and professional life. You'll need to pay to be able to change your profile details that are imported from social media. The app is based entirely on social media. There doesn't appear to be any way to access it if you don't have both a Facebook and LinkedIn account. TheLeague app will draw your matches based on your profession, hobbies and interests. The idea is that you will get matches of people who are similar, but who you don't know. How exactly the matching is done isn't explained. Once your data is imported you'll be able to edit your profile to your exact needs. One thing though is that you will need to upgrade to a paid account in order to do this. So keep that in mind before you get started. Upgrades will give some other perks like extra matches and invitations to events. Rss Feeds. Subscribe to comments for this site. [?] Receive updates about Theleague.com directly through your newsreader.